Once upon a time when I was a kid–probably between ages six and eight–I remember having a full-on freak out at bed time. I was sitting there, gasping for air, keening like a wounded animal. All because I was suddenly gripped with a paralyzing and suffocating fear about dying. I couldn’t shake it. My dad was called in to cope. Either because my mom tried and wasn’t getting through or she decided this was more my dad’s wheelhouse or because she had lots of other little kids to put to bed; I don’t remember. I do remember sitting with my dad by the fireplace, listening to him talk. I don’t remember what he said. I really wish I did. All I know is that I eventually calmed down enough to go to sleep that night and many other nights in the future. I’ve had many years to wonder about and think what I would tell my own children, when they wake up gasping in the night some day. When they realize that everyone on this Earth and everyone they love and even their own little bodies will not be here forever. I hope I don’t completely muddle it. I’ll try to talk about God and heaven and things, but I certainly don’t have it all figured out. In many ways, I’m not so far from that young girl who was scared to close her eyes at night. What does make sense to me is talking about having too much ice cream, or gelato, if we are still in an Italian frame of mind. 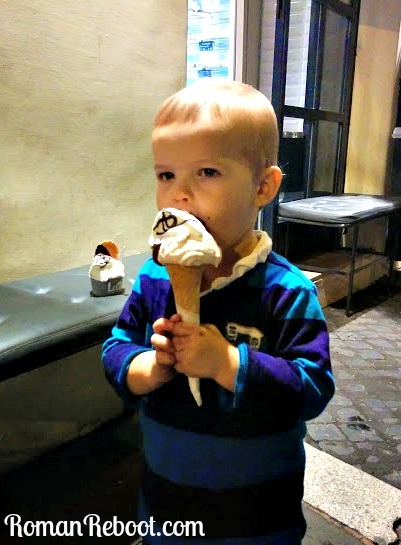 I’ll try to explain that having all the gelato you want, all the time, every day sounds like it would be wonderful. For awhile, it probably would be wonderful. But then, eventually, you’d start to crave something else. Maybe brownies. Or potato chips. Possibly you may even start to want some apples or broccoli. I know it sounds hard to believe, but you really would get sick of gelato. That’s why gelato is a special treat food. That’s why we savor it. Because we know it won’t go on forever or always be there. Meaning that your life is like gelato. If it went on forever and always, it wouldn’t be special. You wouldn’t feel a push to do things or try things because there would always be more time. But it is finite. It is special. You only have so much of it. You have to act now. You have to try all the things and meet the people and sing the songs or do whatever you want to do. It is special because it is scarce. And precious. I’m not sure that this is the best analogy. Or that it even makes sense, particularly to a six year old. I’ll have to work on it. But this does somewhat describe my thoughts on my time at home. When we first got here, I reveled in all of our free time. The days stretched out and we could do anything. Or nothing. Whatever we wanted. After feeling hyper-scheduled, this abundance of time was just what I needed. Until it wasn’t. Too much gelato. The freedom started to feel stifling. More clock watching instead of enjoyment. This is one of the reasons I’m enjoying Henry’s part-time adventures at school. It isn’t a true break for me because I’m still hanging out with wants-to-walk-everywhere-but-can’t Mac, but it provides some structure to our days. The little bit of structure helps make the rest of our unscheduled time that much sweeter. I may continue to tinker with the gelato balance in our days, but, for now, it definitely helps.